Wow, another month has flown by. Can you believe that we are half way done through the year? Another 6 months and it will be 2017. Now I know why the expression "Christmas in July". Well, don't be mischievious like Mia (picture below), and follow us too see what is happiling at Just Happiling. 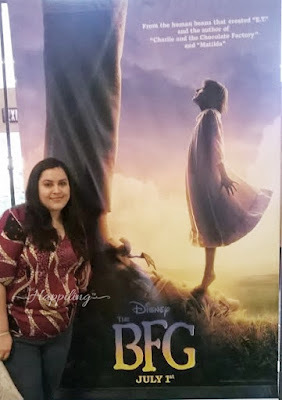 We were honored guests at a special advanced screening for Disney's The BFG this past Monday June 27th (thank you Allied Hispanic). As part of the press team, we were assigned some of the best seats, from which we were able to appreciate this movie perfectly well. We usually tend to arrive early to movies, so we get very similar seats. Although I am not a big fan of 3D, let me tell you that this movie is totally worth to watch in this venue! Not only do you have the magic of Roald Dahl, Steven Spielberg, and Disney to bring this beautiful story to life; but the 3D literally brings it to life as well. I caught my husband trying to reach out into the screen trying to grab a few objects that seemed to be popping out. And I don't blame him, to me, it just felt like we were inside each scene with the characters as well. This is a great movie for kids of all ages! I know I am making a big fuzz about it, but I just can't help myself. 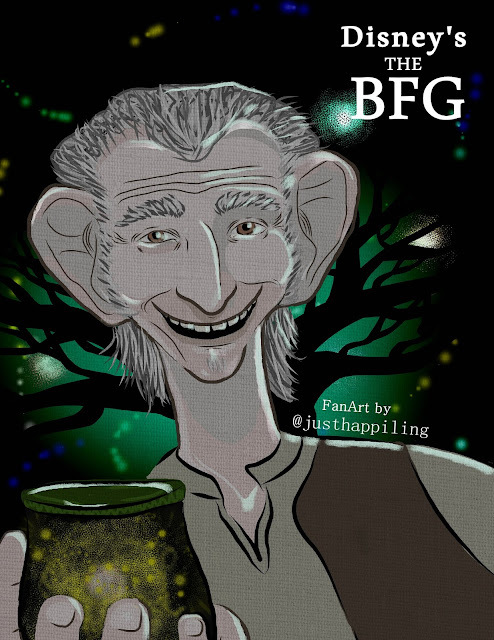 Disney's The BFG is so inspiring as I mentioned before, that as soon as I got out, I just wanted to keep that image I had in my head, of a kindhearted giant, because it proves my point. Smiling is super contagious! Everytime the character smiled, I couldn't help but smiling too. It was a very cozy feeling in my chest--almost as if my inner-self had found some sort of fountain o f youth and started reverting the aging process. So I made a quick piece of art with one of my favorite scenes. I felt like most of this week was about our hobbies. We went to the movies, which is one of our favorite pastimes. But I also went treasure hunting to a thrift shop near by. I took a food photography class not long ago, and ever since then, I have been on the hunt for props for my food photography pieces. There are some items in my list that I have yet to find, however, on this trip, I found loads of tiny pieces of flatware. I was very excited about it, and also a little scared. I honestly don't know if this is going to become one of those collecting scenarios where my collection gets out of control or not, lol. I guess when you are a compulsive collector, you really don't know what is going t happen along the journey. I felt a little like my mom, who collects spoons from different places around the world, when I found these little shiny treats. The picture above shows what I found, and I also feel like this would be the right moment to ask you guys if you have any interesting collections you'd like to share. I would love to know all about it. If you intend to share on social media, just add #JHthisismycollection (JH this is my collection) so everyone can see it too. 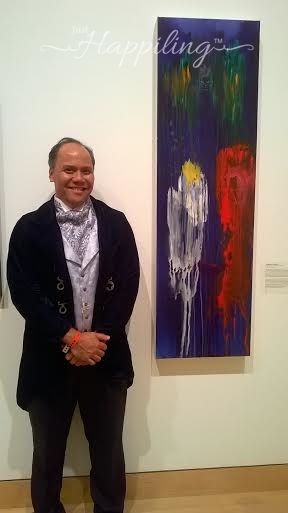 During the last week of May, we were invited to the opening night of the art exhibit; Unlocking Wonderland, at The California Center for the Arts, Escondido, to support one of our friends who had a thematic piece displayed. This week, we were invited by him to the closing party, and though it won't happen until another month or so, we are very excited about being able to hang out with the other artists involved in this art exhibit. If you want to see some photos behind the scene from different attendee's perspectives, check out the work of these very talented artists through #unlockingwonderland, on instagram. Our friend Ron Brillantes and his piece for this art exhibit. Just so you know, the exhibit is not over! If you want to see it for yourself, you have until August 14th, 2016, which is the last day. While you are there, you might want to see the SUPER exhibit next to it. You'll know what I mean once you are there. Ticket Prices are $5-8 and kids under 12 years of age enter free. We had something new in the kitchen as well. My husband made humus and falafels from scratch, and we have been eating this almost all week for dinner. What can I say? When something is delicious, you just can't get enough of it. If you want the recipe for this, let me know by leaving the comment "I want the recipe" on the photo in our IG account @justhappiling. If we get to 100 likes, I will make a post with the recipe and photos. Just make sure you are following us so you don't miss it. This might sound a bit silly, but this week was pretty odd in some respects. I just kept on finding things that I had lost, and this brought me hope. You see--during 2011, I was going to go to Mexico to visit my family, and I felt I didn't want to take my engagement ring with me; I hid it. The problem was that I hid it so well, that after my trip, I couldn't find it myself! I ran so many scenarios in my head, that I wasn't even sure if I had taken it with me, lost it in Mexico, on the plane, at the airport, at the house in Mexico, at my old when I went to visit, or in our house here in San Diego. It was totally insane. I saw myself dropping it on the airplane, but I wasn't sure if it was a paranoid possible scenario that looked so real it might have happened or not. So, after turning my house upside down for a year, I had to wait until my next trip to Mexico to turn that house upside down too. Five years had passed--I was sad, but never lost hope. I always thought that if by any chance, I had truly placed it away for safe keeping, that sooner or later it was just going to appear. To be honest, after all that time, I even thought of just buying it again and telling my husband I had found it. But then, I felt that if it ever actually appeared, I wouldn't know what to do with the second one. I never really found another ring like mine. A year after my husband got my ring at JC Penney, they sold out! Amazon sells a ring that looks similar, but the color of the metal and stone are different; it just wasn't the same. I am glad I chose not to buy it again, because I found it last weekend--ah-ha! I was very excited about it, but was not showing any excitement, because in a way I was in such denial, that it took me a whole day to realize I had in fact found it after all this time. All I have to say is that I did a good job hiding it. A thief would have never find it, lol. Now, I have to take it to be cleaned. I know it might not look very fancy, but this piece is priceless for what it represents. I was proposed at the fountain of The Rose Garden at Balboa Park, and that moment is what the ring represents. It has the color of the fountain, and the vines in the sides represent the garden. Yup, you guessed it. We also chose to get married there; it was very special. Talking about lost and found. 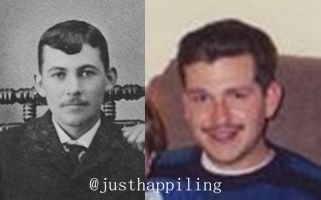 I was very excited this week too, because I also found some of my family ancestors that I had no idea about. One of the hobbies I do whenever I have art-block or writter's-block is research. Lately I had been focusing my research towards my family tree. 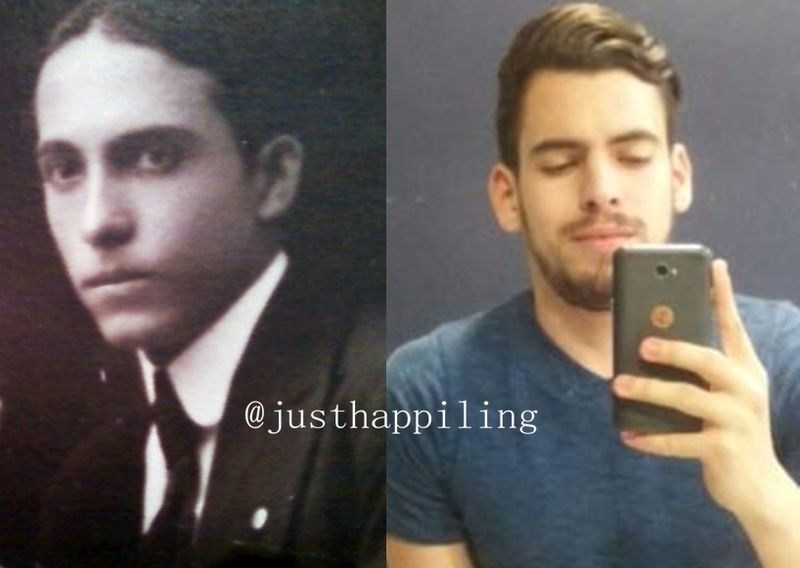 My research has mainly focused on my mom's paternal side, because my grandfather died when I was very young, and therefore, we lost contact with that side of the family. Because I live so far away, it is hard to go look for my relatives. That is where the research becomes super awesome, just like a treasure hunt. Lucky for me, I found a great resource in the Family Search website. I know that there are other sites in the world wide web. However, researching family ancestry can be so time consuming, that paying for a monthly fee was just not going to work for me. If I was dedicating 24/7 to the research, I would know that my money would be well invested. But knowing myself, I do it on an off, so the monthly fee was just going to be too much. Family Search gives you a free and very substantious alternative. The only thing you have to be aware of is that sometimes you might have some research bumps that can slow you down. You have to know or learn how to read cursive calligraphy, and sometimes even hieroglyphics. Yup, people have been having bad handwriting since people could write! The other thing is that you have to be very patient, because sometimes you will have to go through many record books, some of which might have pages and ages of this (see picture below). 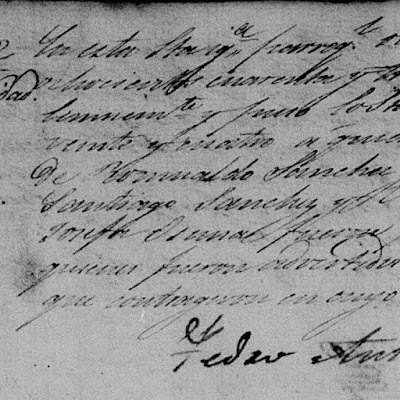 At the end, believe me, finding ancestors you didn't even know, and sometimes even finding you had more in common that you'd know is always very gratifying. When I am bored with my family research, I work on my husband's family tree. Sometimes we also get a few surprises like in the photo below. My husband thought it was creepy, but I thought it was super cool! To be honest, I am glad that this hobby requires so much attention to detail and the discoveries are always a surprise. This will be a great activity to put our kids to do whenever they dare to say: "I am bored". Who knows, it might even keep them busy all summer long, plus give them a whole different learning experience. So what is happiling in our garden? Oh I must say that the intense heat to which we received the summer did a lot of things. Some plants burned, like our roses and some of the greens. Those that did not burn, grew a ton. Just look at our garden jungle, it's madness! The cherry tomatoes are producing a lot, and some of the fruit is even ripening. The cucumber plant we have up front has been producing a lot of fruit too! You don't see it, because we ate most of them this week. All the citrus trees have fruit, and I just can't wait to see it start changing color. We also have hints of color from flowers here and there. The purple one you see above is a bee balm plant, which attracts beneficial insects, and the rest are pepper pants. It's a mini jungle out there! Talking about plants and collections, a few years back, my husband started collecting fig trees. This is how I came to the conclusion that we definitely need a bigger space! Lol. So hopefully we can save enough to have our own organic farm. So back to the fig trees, up in the balcony, we also have a few other plants that are producing fruit too. Some of which are fig trees. In the photo above, you can see the Olympia Fig tree. This is the first time it has fruit in our home, after taking a few years to settle, and we just had a taste of this fruit for the first time too. If you are curious, James said the flavor is very flowery. To me, it was just in the right spectrum of not too sweet and not too tart; it was perfect! Once again, if you want to know what is going on in our happiling life, we invite you follow us through social media, where you can also interact with us. Don't forget to check our July giveaways in our giveaway page, good luck!